How do I type in a circle in Illustrator? How can I type on a path in Illustrator? I remember when I learned how to set text to a path in Illustrator back in the day. How simple it was really pissed me off! So I figured I’d show some of the beginners out there how to do it. Along with setting the text to a path, I show you how I go about choosing which path to use, prepping it if it’s a compound path as well as how I go about lining everything up. There’s also a few things in there on correcting kerning issues and pulling the text off of the path itself in order to get your text right where you want it. For this one, make sure your character palette is open by going to WINDOW-TYPE-CHARACTER or just hit CMD+T. For screenprinters, this is a great way to set up your text for left chest imprints. Try it on your next gig! 1. Select or make your path to which you want to set your text. 2. If it’s a compound path, release the compound path and combine it in the pathfinder. 3. Select the text to paths tool, click on your desired path and type away. 4. When done, select all and convert your fonts to outlines. Make sure you save a working file without the fonts converted to outlines if you wish to go back in and edit your text. When working with text in both Illustrator and Photoshop in any capacity, a quick way to deselect your text is to hit Cmd+Enter. Another tip that works in Illustrator only is to hold Cmd while clicking somewhere on the artboard. That will also get you off of your text so you can continue to work. 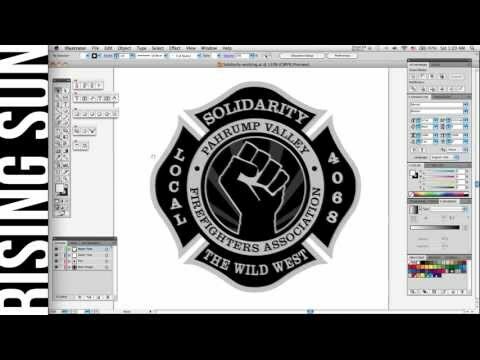 Thank you brother for all the wonderful logos you designed for the Pahrump Valley Firefighters IAFF Local 4068! My pleasure, Ray! Anytime you need anything, you know where to find me. Keep safe out there!